Tartosc Coal Tar Bathing Bar is a dermatologist approved bathing bar that washes away germs and gives relief from unwanted germs. Tartosc Bathing Bar is enriched with Bergamot oil and Tea Tree Oil. Tartosc bathing bar is dermatologist approved formula, which has no harmful effects. It helps restore the skin's natural barrier and helps controls the production of sebum and dead skin cells. 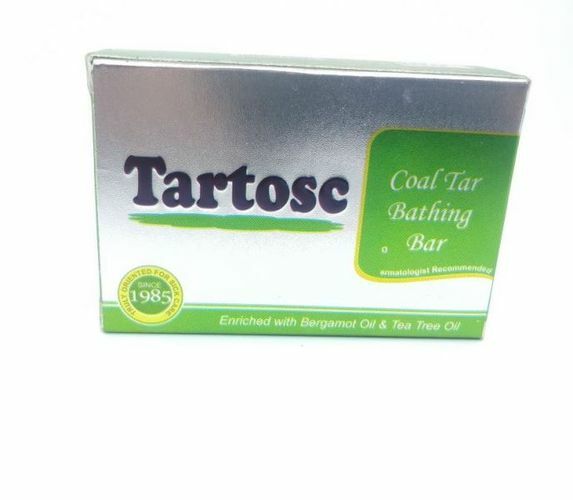 Tartosc Coal Tar Bathing Bar is enriched with Bergamot Oil and Tea tree oil. Bergamot oil in it is commonly used for making skin tone attractive and beautiful by reducing the fading effects of acne which can leave noticeable scars and marks on the affected area for many years. Coal tar is helpful in the management of eczema and acne. Tea tree oil helps in the prevention of bacterial infections and fungal infections. Blend of the essential oils makes Tartosc Coal tar Bathing Bar a complete solution for skin problems.